Below is a list of frequently asked questions and their answers regarding commercial HVAC systems. How does my AC work? What type of AC systems are available? How is humidity controlled with an AC system? How do refrigerants deplete the ozone layer? Heating, Ventilating, and Air Conditioning (HVAC) equipment perform heating and/or cooling for residential, commercial or industrial buildings. The HVAC system may also be responsible for providing fresh outdoor air to dilute interior airborne contaminants such as odors from occupants, volatile organic compounds (VOC’s) emitted from interior furnishings, chemicals used for cleaning, etc. A properly designed system will provide a comfortable indoor environment year round when properly maintained. In the case of direct expansion equipment, the air passing over the indoor cooling coil heats the cold liquid refrigerant. Heating the refrigerant causes boiling and transforms the refrigerant from a cold liquid to a warm gas. This warm gas (or vapor) is pumped from the cooling coil to the compressor through a copper tube (suction line to the compressor) where the warm gas is compressed. In some cases, an accumulator is placed between the cooling coil and the compressor to capture unused liquid refrigerant and ensures that only vapor enters the compressor. The compression process increases the pressure of the refrigerant vapor and significantly increases the temperature of the vapor. The compressor pumps the vapor through another heat exchanger (outdoor condenser) where heat is rejected and the hot gas is condensed to a warm high pressure liquid. This warm high pressure liquid is pumped through a smaller copper tube (liquid line) to a filter (or filter/dryer) and then on to an expansion device where the high pressure liquid is reduced to a cold, low pressure liquid. The cold liquid enters the indoor cooling coil and the process repeats. As this liquid passes through the indoor cooling coil on the inside of the heat exchanger, two things happen to the air that passes over the coil’s surface on the outside of the heat exchanger. The air’s temperature is lowered (sensible cooling) and moisture in the air is removed (latent cooling) if the indoor air dew point is higher than the temperature of the coil’s surface. The total cooling (capacity) of an AC system is the sum of the sensible and latent cooling. Many factors influence the cooling capacity of a DX air conditioner. Total cooling is inversely proportional to outdoor temperature. As the outdoor temperature increases the total capacity is reduced. Air flow over the indoor cooling coil also affects the coil’s capacity and is directly proportional to the total capacity of an AC system. As air flow increases, the total capacity also increases. At higher air flow rates the latent capacity of the cooling coil is reduced. Indoor temperature and humidity also affect the total capacity of the AC system. As indoor temperatures increase, the sensible capacity also increases. Similarly, as indoor relative humidity increases the latent capacity of the AC system increases. Manufacturers of AC equipment typically provide a “performance map” of specific equipment to show how total, sensible, and latent capacity change with changing indoor and outdoor temperatures and humidity. Power consumption and energy efficiency are also provided in these charts. A split system is a combination of an indoor air handling unit and an outdoor condensing unit. The indoor air handling unit contains a supply air fan and an air-to-refrigerant heat exchanger (or cooling coil), and the expansion device. The outdoor condensing unit consists of a compressor and a condenser coil. 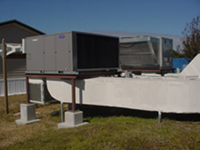 Split-systems are typically found in residential or small commercial buildings. These systems have the highest energy efficiency rating (EER) of all the available AC systems. Manufacturers are required to take the EER rating a step further and provide a seasonal energy efficiency rating (SEER) for use by consumers. SEER ratings vary widely and range from 10 to 20. The higher the SEER rating, the more efficient the AC system operates. If heating is required, an alternate method of heating the interior of the building must be used, usually in the form of electric or gas heating. A packaged system is a single unit combining all the components described in the split system. Since the unit is a package, it must be placed outside the building and indoor air is “ducted” from the building to the packaged system and back through an air distribution system. These units typically have SEER rating from 10 to 18. If heating is required, an alternate method of heating the interior of the building must be used, usually in the form of electric or gas heating. Heat pumps are similar to cooling only systems with one exception. A special valve in the refrigeration piping allow the refrigeration cycle to be operated in reverse. A cooling only system cools the indoor air and rejects heat to the outdoors. A heat pump can also cool the indoor air, but when the valve is reversed, the indoor air is heated. A supplementary electric resistance heater may also be used to assist the heat pump at lower outdoor temperatures. In colder climates, heat pumps require a defrost period. During defrost times the electric heater is the only means of heating the interior of the building. These units are manufactured as either split or packaged systems. In a chilled water system, liquid water is pumped throughout the building to “chilled water coils”. Since the liquid water needs to be at a cold temperature, a “cooling plant” is required. The plant is typically referred to as a chiller plant. Vapor compression equipment in the plant, similar to that described in “How does my AC work”, cool water to a cold temperature and pump the cold water to air-to-water heat exchangers where needed. As the name implies, a window air conditioner is typically installed in a window or custom opening in a wall. The Window AC can only cool small areas and are not intended to provide cooling to multiple rooms or zones. These air conditioners are manufactured as cool only or can provide both cooling and heating. An optional damper in the unit can provide fresh outdoor air if necessary. Packaged terminal heat pumps (PTHP) are are similar to a window-mounted air conditioner. These units are typically installed in a sleeve passing through the outdoor wall of an apartment, hotel, school classroom, etc. PTHPs are completely self contained and require only an electrical connection in addition to the opening in the building shell. They use the outdoor air as the heat source in winter and as a heat sink in summer. They also can provide ventilation air. Flexibility and lower installed cost are the primary advantages of the PTHP. Disadvantages include in-room maintenance, higher operating cost, relatively short life, imprecise "on-off" temperature control, and they can be rather noisy. Humidity is becoming more of a concern to building operators and owners. High indoor humidity leads to mold and mildew growth inside the building. The are several methods of controlling indoor humidity. The simplest (and most expensive) method is to connect a humidistat to an electric heater. When the humidity inside the building rises above the humidistat set point, the heater is turned on. The additional heat causes the air conditioning system to run longer and remove more moisture. A more efficient method of controlling humidity is to use the waste heat from the refrigeration cycle itself. Instead of rejecting the waste heat outdoors, the heat is directed inside when humidity control is required. One form of heat reclaim is called hot-gas reheat or “refrigerant desuperheating” where refrigerant is passed through a heat exchanger located downstream of the cooling coil. The hot high pressure vapor leaving the compressor passes through this heat exchanger prior to entering the condenser coil. This in turn heats the indoor air and again causes the AC system to run longer to meet the thermostat set point. Although more energy is used, this is much more efficient than turning on an electric heater. Another form of heat reclaim is called sub-cool reheat. This strategy takes the warm liquid refrigerant from the condenser and passes it through a heat exchanger located downstream of the cooling coil. Less heat is available using this method because the majority of the heat has already been rejected at the condenser. Since more energy is used to pump liquid (as opposed to a gas) through the heat exchanger it would appear that this method is less efficient than the hot-gas method, however, the liquid in the heat exchanger is sub-cooled in the cold supply air stream which increases the capacity of the air conditioner. Since more capacity is available, the AC units is able to meet the thermostat more quickly. Refrigerant 22 (R-22 or MonoChloroDiFlouroMethane, CHClF2) is one of the most common refrigerants and is used in a wide variety of applications such as refrigeration, aerosol propellants, cleaning solvents, and foaming agents for plastics. This refrigerant is believed to be partially responsible for damaging the earth’s ozone layer and it’s use is being phased out over the next two decades. The ozone layer is a result of sunlight reacting with oxygen to produce a layer in the stratosphere more than 10 km above the earth’s surface. As R-22 refrigerant escapes from an AC system through leaks or is released into the atmosphere by other means, the R-22 molecule containing the chlorine atom (“monochloro”) rises in the atmosphere. Sunlight breaks down the R-22 molecule to yield a free chlorine radical (Cl-). The free chlorine radical combines with ozone (O3), decomposing it into normal oxygen (O2). AC refrigerants come in many varieties. R-22 is the most common, however, due to interactions with the ozone layer R-22 is being phased out. Refrigerants manufactured as replacements for R-22 are HFC-134a, R-410a, R-410b to name a few. The new refrigerants do not contain the chlorine atom and are not harmful to the earth’s ozone layer.